"A light seafood dishes that pleases the taste buds and the eyes!" Bring a large pot of lightly salted water to a boil. Add pasta, and cook for 7 to 9 minutes, until al dente. Melt 6 tablespoons of butter with the olive oil in a large skillet over medium heat. Mix in the parsley and garlic and cook for a couple of minutes until fragrant. Add the mushrooms and asparagus and season with salt, pepper and onion powder; cook, stirring occasionally until asparagus is tender, about 5 minutes depending on the thickness. Place the scallops in the pan, and cook briefly on each side until lightly browned and the center is cooked through, about 3 minutes per side. Remove from the heat when scallops are just finished. Meanwhile, in a small saucepan, combine the milk, mascarpone cheese and remaining butter. Cook over medium heat, stirring, until sauce is warm and butter is completely melted and blended in. 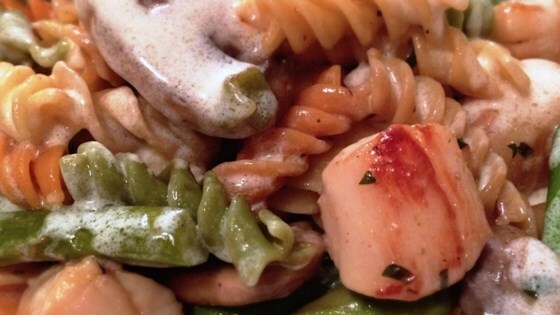 Stir this sauce into the scallops and vegetables along with the pasta and serve immediately. I found this recipe at the last minute and couldn't find the Mascarpone cheese. I used 8 oz. of cream cheese instead and it was absolutely delicious!! Very thick and rich!! We loved this recipe! Absolutely delicious! After reading some reviews I used 8oz of cream cheese instead & made a little less pasta. Followed the rest of the recipe exactly and it was great! Excellent, excellent, excellent! GREAT way to make a more stable "creamy" sauce. Only change I made was using fresh onions instead of powder, and adding some shrimp!